Most that know me know how much I detest change. However, there has been a cultural change over the last decade that doesn’t bother me a bit. The practice of sending Christmas cards through the mail has all but evaporated. The last time I sent out Christmas cards was in 2001. To spend money on a card and excessive postage, plus the trouble of signing them addressing the envelope, sealing them up and driving the stack to the post office is just a little too much – especially at this time of year. You always hoped that your card would be fussed over when it was opened and would be prominently placed on someone’s mantle after they took time to read it. Chances were, however, that it sat in a stack on the recipient’s kitchen counter for a few days after it was opened to indifference, before being unceremoniously dumped in the trash with the empty egg-nog and boiled custard containers. Part of the appeal of Christmas cards was to bring your far away friends up to date on what has been going on in our lives. Now we have Facebook, Twitter, e-mail and blogs for that. In years past, some people went to great lengths to send me “Christmas letters” that they had been working on so diligently. If it was more than about three sentences, I rarely read further. I wasn’t really that interested that their Little Timmy had scored three goals in soccer that season. The worst was when friends of mine from high school and college would send a Christmas card that consisted of nothing but a photo of their three adorable children that I had never met, nor had any real desire to meet. Being the superficial and shallow person I am, I was much more interested in seeing how much my friends had aged than I was in what their offspring looked like. My grandmother would always gaze at the front of each Christmas card, taking in everything that it had to offer; before opening it up and reading every word. Some real sappy cards can go for two or three paragraphs. My grandmother would read every single word, as if the sender had written the words themselves. When I did send out Christmas cards, I always went for those that had some humor or were fairly generic (read: cheap). If I really wanted to impress the recipient, I would find one that reflected some of my hobbies. You can’t find too many IndyCar cards in the south, so I would settle for cards that contained something related to the Tennessee Vols or Titans. Those usually went to the very special people on my list. By now, I’m sure that I’ve convinced some that I’m a grinch or a humbug – I’m not. Please don’t get me wrong; I love Christmas and I always enjoyed getting Christmas cards. I just didn’t like to send them. It was always a thrill to see a big red or green envelope with my name on it. I would keep many of them for years. Ten years ago, I had an entire basket of cards that I would receive in one Christmas season. As of this past Saturday, I have received two – and one of them is from someone that is really more of a friend of Susan’s. So add Christmas cards to the list of things that the internet has rendered obsolete; along with magazines, newspapers, catalogues and anything else that the post office used to rely on for revenue. 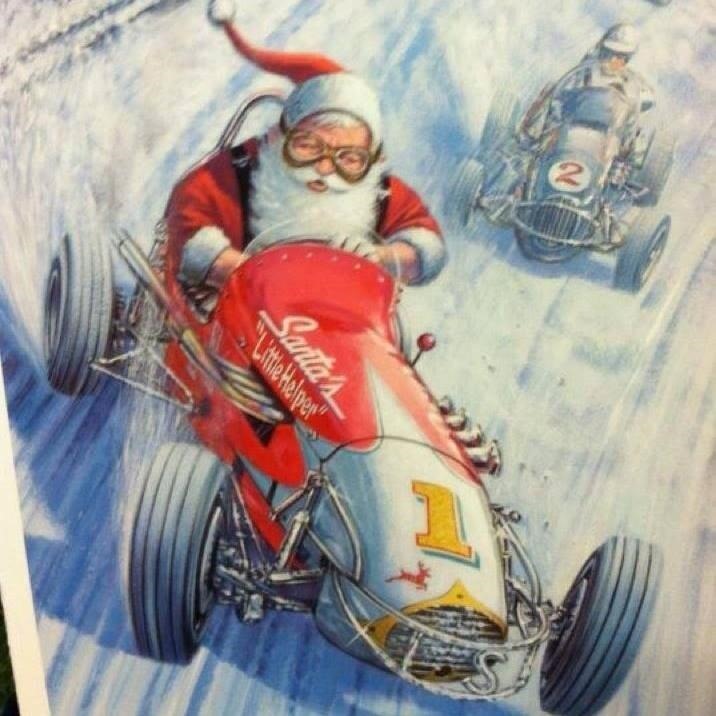 With that being said, I have seen some very clever electronic IndyCar Christmas cards on Facebook and Twitter this season. I started to post an entire collection of cards that I’ve seen over the past month – most of which feature some beautiful photos of a snow-covered Indianapolis Motor Speedway or Santa Claus sitting in Gordon Johncock’s 1982 winner that is parked in the snow. But this one really caught my eye. I can’t remember who originally posted it, but chances are they got it from someone else. Whatever the case, I hope I am not violating any copyright laws by posting this one on my site, but I felt it captured the true essence of the Christmas spirit for hard-core racing fans. In parting, let me say that Susan and I both wish each and every one of you a very Merry Christmas and the Happiest of New Years! It’s been another great year and we both are looking forward to another year of blogging at Oilpressure.com in 2014. Please note – Although we are very much looking forward to another great year, I need to re-charge my batteries from time to time. Therefore, I am going to take my usual Christmas break from this site over the holidays. This will be my last post here until Monday, January 6. This entry was posted on December 23, 2013 at 4:04 am and is filed under IndyCar. You can follow any responses to this entry through the RSS 2.0 feed. You can leave a response, or trackback from your own site. So, I’m guessing that on Christmas Eve you all gather around a picture of a Christmas tree on your laptop and tweet Christmas carols of 140 characters or less? You forgot about the video fireplace. Merry Christmas, Ron. Merry Christmas to you and Susan. One of the things I was able to enjoy this year was meeting both of you. For this devoted reader of OilPressureBlog to meet the people behind the words was a joy. Merry Christmas and Happy New Year to you and Susan, George, and nothing but the happiest of holidays to everybody who frequents Oilpressure. Here’s to a great 2014. Merry Christmas, George and Susan! Please get Simona in an Indycar soon. Please increase the number of teams and cars and drivers. Please don’t let them delay the aerokits another year. Please bring us a well-heeled and involved series sponsor. And please bring us a couple ovals and a road race in Austin in 2015. Merry Christmas to the Oilpressures. Merry Christmas George and Susan! Merry Christmas and a Happy New Year George and Susan. Thank you both once again for all the time and effort you put into this blog site. Your knowledge and humor are exceptional and it is almost like a little Christmas gift everytime I get to read a post. Take care my friends and here’s to an even better 2014 for all of us. Happy New Year, One and All!! I look forward to the first posting (and comments) of 2014.